Sometimes you need to say what you need to say. If Your looking for Coaching for your Speaking Voice or General American Accent Training, go to the LAvoiceJOY tab at the top. It’s all about VOICE here - from the artistic voice to the tangible voice, there are as many voices as there are sides of ourselves. And your voice contains them all. Mining for Voices - exploring, revealing, and bringing voices forward. Whether its the expressive voice of the actor or the powerful voice of the executive, the voice of the narrator in a story, the voice of the characters who inhabit the story, the authentic self finds a way to come through the voice. If you’re interested in the human voice in all its manifestations, I invite you to click around the website. 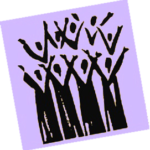 By clicking on the LAvoiceJOY tab at the top, you can read about the classes, private voice sessions, voice workshops and other events before they sellout. Sign up for my newsletter and I'll send the info to your directly - a few times a year. Follow me on social media, you can even buy my vocal warm-up and practice unlocking your own voice. But whatever happens, never lose sight of your voice. Read about Adele's latest book and more. Hear demos of Adele's VO work. Voice, dialect & speech coaching for actors & executives.